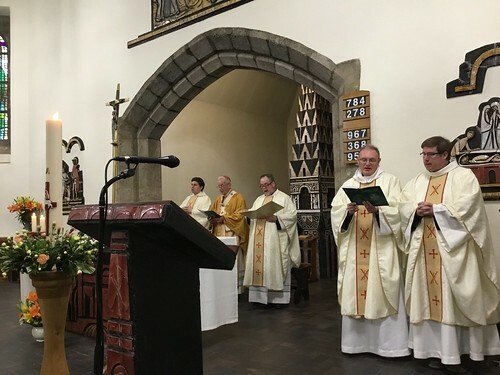 The Greenwich Deanery Clergy gathered on Sunday 29th April 2018 in fraternity and thanksgiving for the ministry of Fr Jim Kirby on the occasion of his retirement. Bishop Patrick presented Fr Jim with a cheque of £1000 from the Greenwich Deanery. Fr Jim will enjoy his well earned retirement in his beloved Ireland. His successor Fr Seba, former chaplain to the Tamil Community in the UK, was among the gathered clergy. 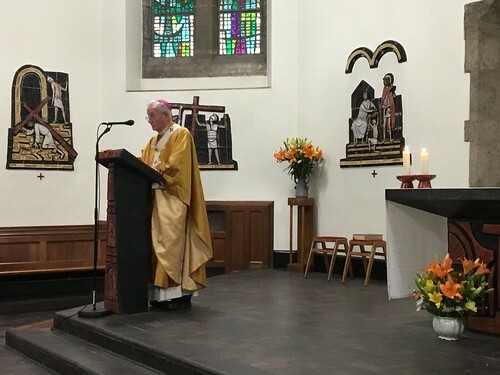 Archbishop Peter Smith has endorsed Rosary on the Coast, which at the time of writing has 321 locations around the UK coast and inland participating in a service at 3 pm on Sunday 29th April 2018. The aim is to encourage a re-flourishing of faith, respect for life and peace in the British Isles. It follows successful similar events in both Poland and Ireland. For those that wish to attend a service there is an interactive map of locations taking part, including many in and around Southwark Dioces. For this informatiion and more details about Rosary on the Coast, Click here. On Monday 23rd April St George's Cathedral honoured its Patronal Feast Day and celebrated the Solemnity of St George. Friends and Parishioners joined the Archbishop, Chapter Canons and Cathedral Clergy for Mass in the evening. A relic of St George was placed in St George's Chapel and this was venerated with reverence by both clergy and laity directly after the Mass. A lively and enjoyable reception followed afterwards in Amigo Hall. More photos can be viewed online of these and other events. Click here. We ask all Southwark parishioners to pray for vocations and for those discerning their vocation throughout the year, but especially this weekend. On Saturday 21st April 2018, as part of their Annual Study Day, the RC Southwark Commission for Christian Unity will hold a joint event with the Justice, Peace and Ingregrity of Creation Department of Southwark Anglican Diocese. The theme will be 'Social Justice and the Common Good' and will focus on issues that affect us all, in particular, homelessness, peace and the environment. There will be a range of speakers from Pax Chriisti, CSAN, Housing Justice and Cafod Southwark, amongst others. Bishop Paul Hendricks will also attend the day and give the closing speech. On Thursday 19th April at 7 pm in Amigo Hall, Mark Nash, the Director of Southwark's CCF (Centre for Catholic Formation) will be holding a talk entitled 'Eucharist and the Mission of the Church'. This is the second in a series of five lectures called 'Sharing in his Life', which centres around the Eucharist. As we prepare for Adoremus, the National Eucharistic Congress which will take place in Liverpool this September, these lectures are an opportunity to learn more about this key aspect of our Faith. The lectures will also be a helpful aid to all parish delegates that have been asked to attend the Congress, with a view to rolling out the fruits of Adoremus in their own parish, schools and wider community. For further information on the series visit the CCF website. Father Michael Branch, parish priest of St Peter's the Apostle, Woolwich, and the South East Area Bishop Pat Lynch, were delighted to welcome the Duke of Gloucester last Wednesday, 11th April. The Duke's visit marked the completion of work to replace 175-year-old roofslates and tons of weathered stonework on this historic church, the oldest of three London Catholic churches designed by Augustus Pugin. Members of the parish heritage group led the Duke on a tour of the church interior, including a newly-formed exhibition. As a former architect himself, the Duke also took a close interest in photographs of the church refurbishment work, discussing these with the architect and the representative of the main contractor. All wearing hard hats, the party went on to the upper hall of Pugin Place, the adjacent community centre, originally designed in 1858 as the parish school by Edward Pugin, eldest son of Augustus. His splendid hammer-beam roof was admired in spite of the risk from the fragile 160-year-old plaster between the rafters. The Duke wished the parish well in their efforts to raise funds for the refurbishment of this hall, to restore it for community use. Afterwards Fr Michael said “It was great to have the importance of our parish history and heritage recognised by this royal visit. The Duke also gave a wonderful morale boost for our efforts to bring Pugin Place back into full community use”. On Monday 7th May 2018, St George's Cathedral, Southwark, will host a Mass for Migrants at 11 am with a preceding Banner Procession from 10.45 am. This is a lively and colouful service which jointly celebrates the diversity of Westminster, Brentwood and Southwark Dioceses. Archbishop Peter Smith will be Principal Celebrant this year. The first music rehearsal for the Mass will take place on Saturday 14th April from 2 pm - 5 pm in Amigo Hall, Lambeth Road SE1. If you enjoy singing and would like to lend your voice to this special service please contact the Music Co-ordinator for the Mass, Frances Novillo: Email: francesnovillo@yahoo.co.uk or Tel: 07714 204 201. You do not need to be able to read music but we would be grateful if you could let Frances know in advance if you plan to attend the rehearsal. On Thursday 12 April 2018 the eminent New Testament scholar and acclaimed author, Fr Nicholas King SJ, will give a talk in preparation for Adoremus, the National Eucharistic Congress that will take place in Liverpool this September. Sacred Heart RC Church, Edge Hill, Wimbledon SW19. All are very welcome. On the Feast on the Annunciation of the Lord, when we are called upon to 'become partakers of His divine nature', Pope Francis has promulgated a new Apostolic Exhortation concerned with the call to holiness entitled Gaudete et Exsultate (Rejoice and be Glad). As Pope Francis explains 'Holiness is as diverse as humanity; the Lord has in mind a particular path for each believer, not just the clergy, the consecrated, or those who live a contemplative life. We are all called to holiness, whatever our role, by living our lives with love and bearing witness, and in the everyday turning to God.'... Holiness keeps you faithful to your deepest self, free from every form of enslavement, and bearing fruit for our world. We have received a wonderful update from the Sisters of the Sacred Heart of Jesus in the Archdiocese of Benin, Nigeria. They report that 7,864 adults and young people in parishes, schools and a variety of outstations in the Archdiocese of Benin have attended their presentations about the dangers of human trafficking in the past two months alone. This welcome news has been made possible as a result of the generosity of Southwark Parishioners, CBCEW Santa Marta Group and a number of private donors in our Diocese who have helped to raise £45,000 in order to increase awareness of Human Trafficking, which Pope Francis has described as 'an open wound on the body of contemporary society'. 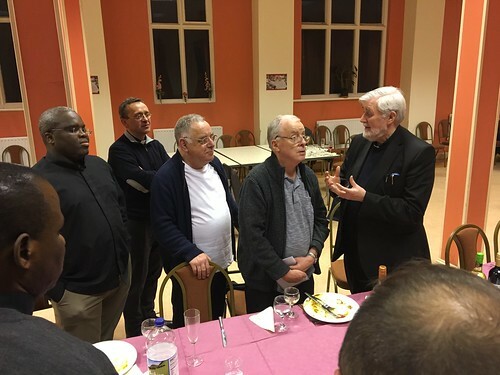 On the morning of Thursday 5th April, Monsignor Matthew Dickens, the Vicar General of the Archdiocese of Southwark, paid a visit to the Manna Centre at its newly refurbished premises in Melior Street. The Manna Society has run the Centre since 1982, supporting homeless people in the heart of London. It was founded by Nannette Ffrench who saw the plight of the homeless people in and around London SE1 and wanted to do something to help them. Following a discussion with Bishop Henderson, one of the Auxilliary Bishops of Southwark at the time, a property was found and a building at 6 Melior Street, SE1, was given freely by the Diocese. The Manna Day Centre is now based at 12 Melior Street, London SE1 3QP and is open from 8.30 am to 1.30 pm, seven days a week, 51 weeks a year. Today the Centre continues to help between 120 - 150 homeless and disadvantaged people every day by providing breakfast and lunch, meals, showers, clothing, housing, welfare advice, medical care and access to computers. About 50 % sleep rough, 25% are in socially rented accommodation and the remaining 25% are in a hostel or stay with friends. What they all share in common is poverty and often loneliness. The Centre is always looking for support. From a financial point of view, assistance is needed to help defray costs, whilst clothing needs to be passed on to those who come to the Centre. Volunteers are also required to help the Centre carry out its work. The Edcuation Commission is currently looking to recruit a new Director of Education. The Director of Education’s role is to promote and manage the educational work of the Archdiocese by providing effective leadership and direction to the Education Commission in the development and implementation of a strategy and on-going management of the team, which delivers on the Archbishop’s core principles of Catholic education. The core requirement for the role is experience of education resources and curriculum management within a comparable organisation, local authority, school or further education setting. It is also essential that the post-holder is able to bring a credible level of understanding of the beliefs and traditions that underpin the work of the Catholic Church in the UK and that inform the development of Catholic education in schools. It will also be important to be able to see the bigger picture and bring an understanding of the accountabilities and pastoral role of the Diocese in the lives of the people and communities it serves beyond its schools. This is a senior role within the Archdiocese and as such is expected to work collaboratively with all other senior managers within the Archdiocese to meet the requirements of the Trustees. The Roman Catholic Archdiocese of Southwark is a Charitable Incorporated Organisation (No. 1173050) and is run by a Board of Trustees led by the Archbishop, who are responsible for determining the strategic direction of the Diocese. Application is by way CV and a Supporting Statement.